I used to make quilts for friends who are expecting but ever since we had our own kids and received a ton of blankets, I decided to gift slings instead. 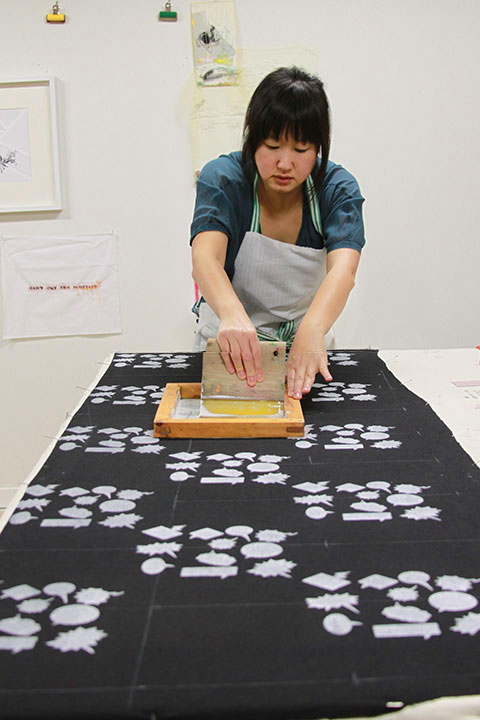 They’re easy to make (much easier than a quilt) and it was one of the primary things we used for our kids. I usually make a matching bib as well, though we really rarely used them. It makes for a nice set. Most recently our friends who have been, and still often are, our creative partners announced their pending bundle of joy. He writes comic books and she’s a designer so I decided to print this speech bubble fabric. I haven’t printed yardage of fabric in ages so I was looking forward to giving it another go. It’s a really small pattern (only an 8″ repeat) that I did quickly as a paper cut stencil. 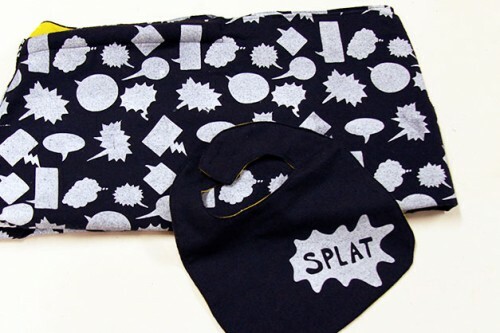 I made a little splat one off for the bib. It’s on an organic black raw silk (that I washed hot and dried hot before printing to make sure it got most of its shrinkage out) and lined with an organic cotton in a baby poop blending green. Tagged baby gifts, baby sling, diy gifts, printing fabric. Bookmark the permalink.